Yurbuds. You may not have heard of the brand before, but you are definitely familiar with the product. Yurbuds are the next big thing when it comes to listening to music while you workout, play sports, train – basically anything having to do with physical activity. Founded in 2008 by an actual triathelete and a marathon runner, Seth Burgett (President & CEO) and Richard Daniels (COO) knew that there was a better way to listen to music while training. Sick of the same old problems of headphones that wouldn’t stay in their ears, Burgett and Daniels came up with a revolutionary product that would forever change the way that athletes and every day people would listen to music forever – Yurbuds. The concept is pretty simple; custom fit an earbud headphone to fit the contours of your ear – making it so that they won’t fall out in the middle of your activity. Their ergonomically designed earbud enhancer, a “Yurbud,” is digitally sized through their website and even an iPhone app – and then delivered straight to your doorstep. 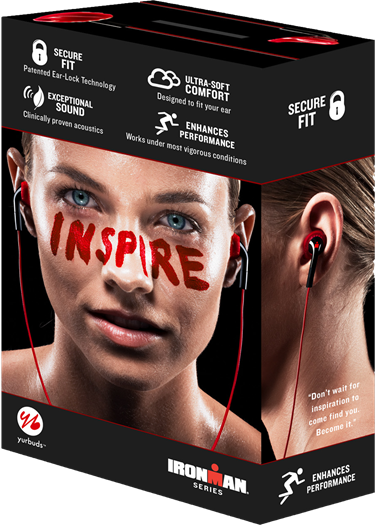 For more information on Yurbuds, visit their offiicial site at yurbuds.com.